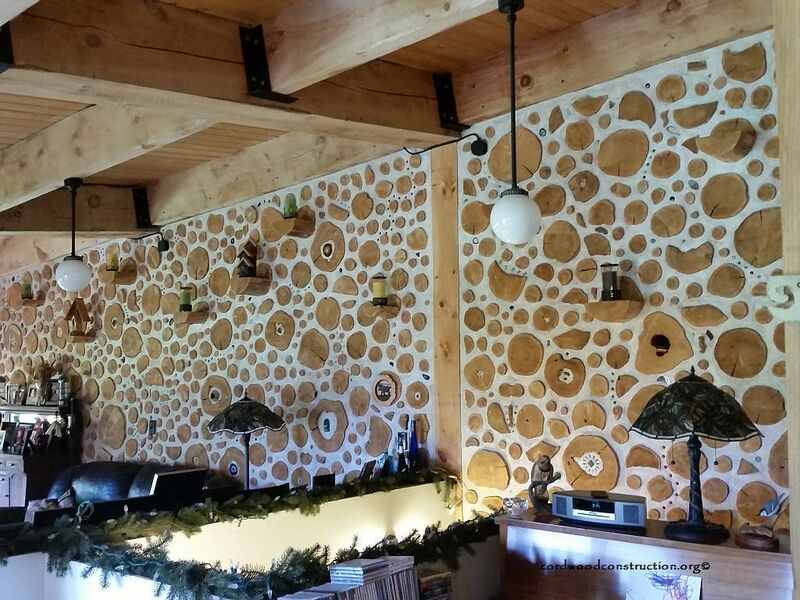 One of thee most beautiful cordwood homes I have ever had the pleasure of seeing is the lovely home of Bruce Kilgore and Nancy Dow in the Adirondacks near Saranac, New York. 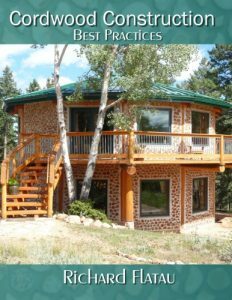 This home is energy-efficient to the max and uses only 2 full cords of firewood to heat this two-story, earth-bermed, double wall, living roof cordwood beauty. This is 9000 heating degree days country, which means it is plenty cold! The living roof helps to keep heat in and provides a year long bucolic display. 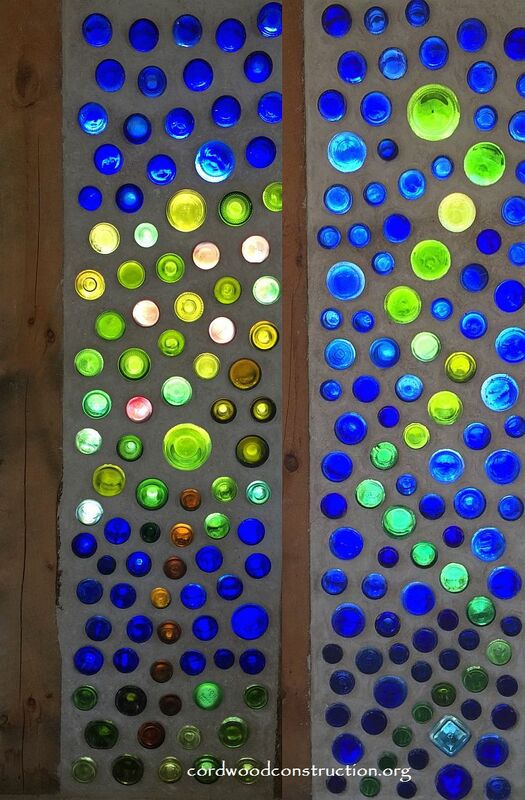 Colorful bottle ends light up the interior of the guest cottage which served as living quarters and a practice building. Nancy smiles happily while she finishes up working on her new porch at the entrance to Ravenwood. 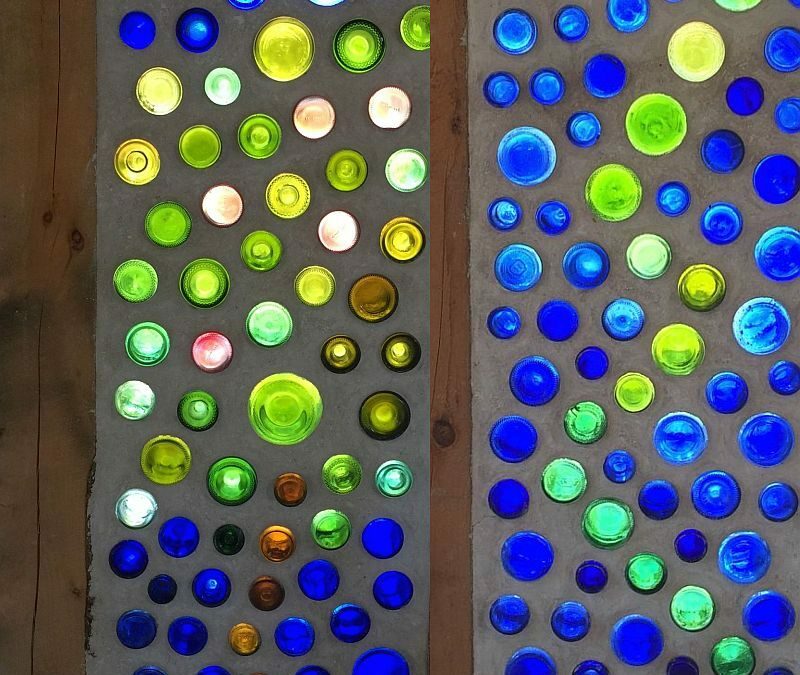 The new bottle end entrance work is spectacular! The porch is almost finished for the upcoming winter. The owl has found a new home and it seems to be eyeing the light switch. There are lots of ravens in the various motifs at Bruce & Nancy’s. 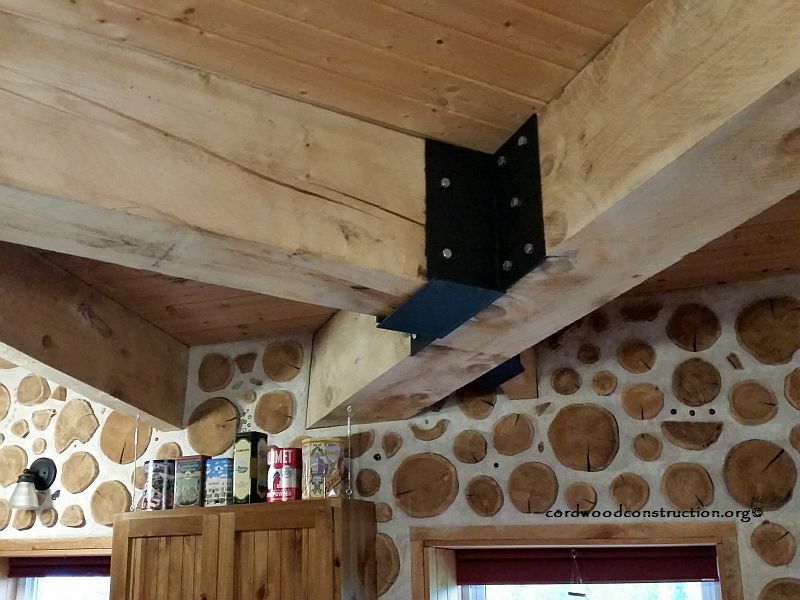 The massive timber frame plays well with the Northern White Cedar cordwood. 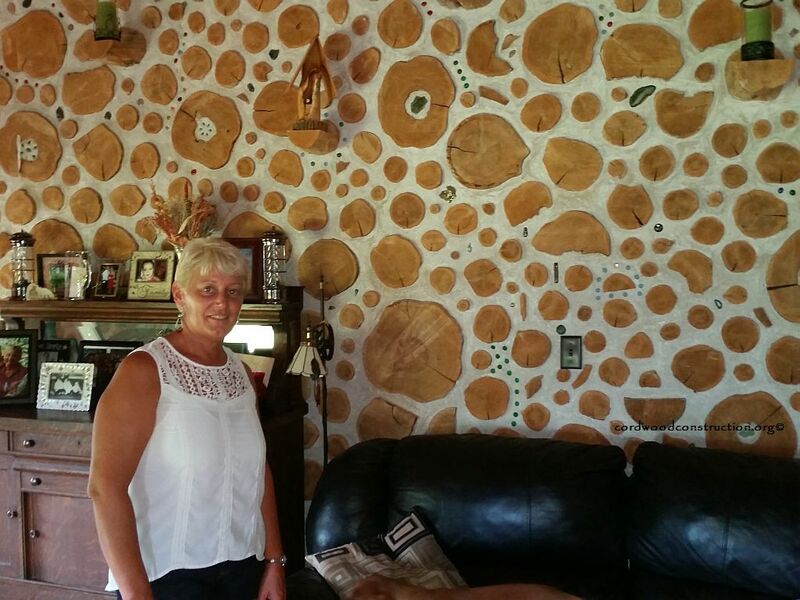 Nancy is one of the few wood masons I know who can mortar in shorts and sandals and not get full of lime. This is a double wall home and here in the interior (second) wall. The soy-based open cell foam insulation is 8″ thick. The total R-value approaches R-40. 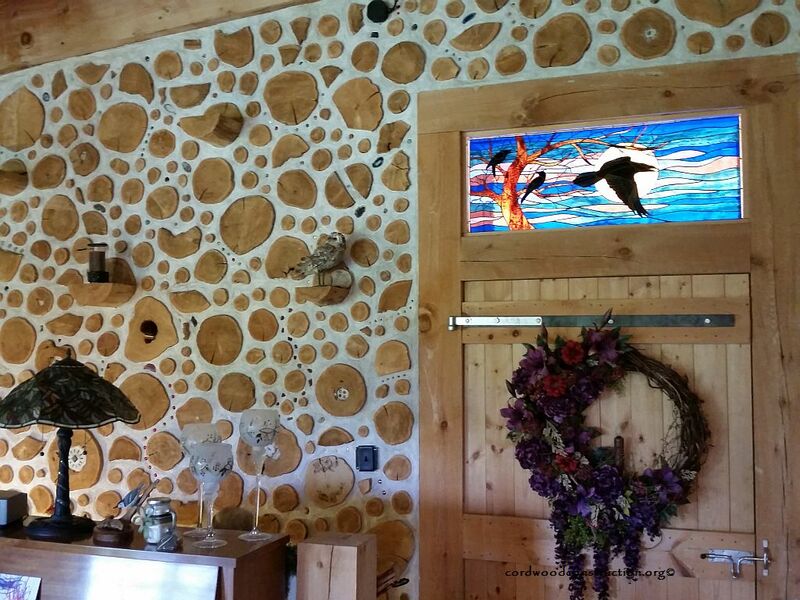 Nancy’s cordwood wall artistry is like no other. Nancy’s mortaring and Bruce’s mixing are a match made in heaven. Precise lime putty mortar with an artists penchant for design and flow. Simply gorgeous. Here is their incredibly efficient masonry heater. 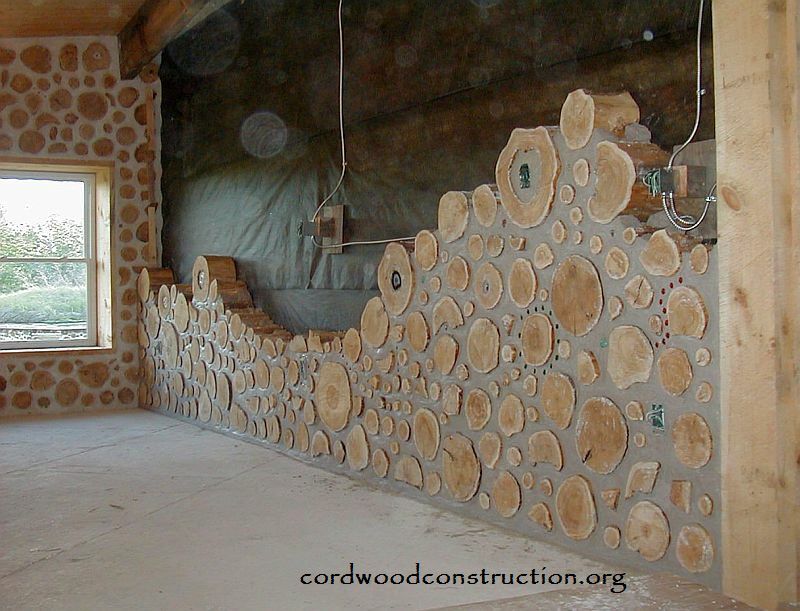 It uses 2 cords of wood to heat this most energy efficient, double wall cordwood beauty. 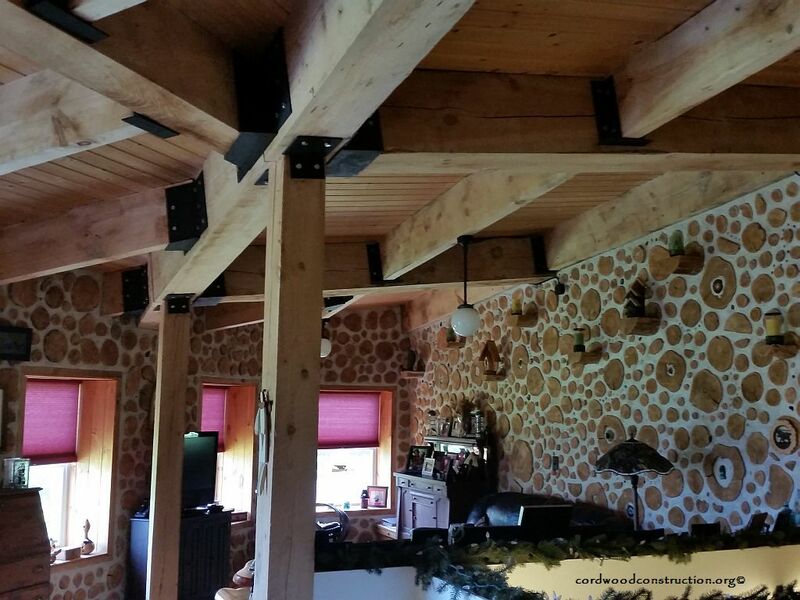 Click to visit their Ravenwood Facebook Page Beautiful, massive beams with handmade metal framing. The framing is 8 x 8″ and some of the ceiling framing is 16″ x 12″ and 4″ x 12″. Bruce made all the metal brackets by hand. What a metal artist. 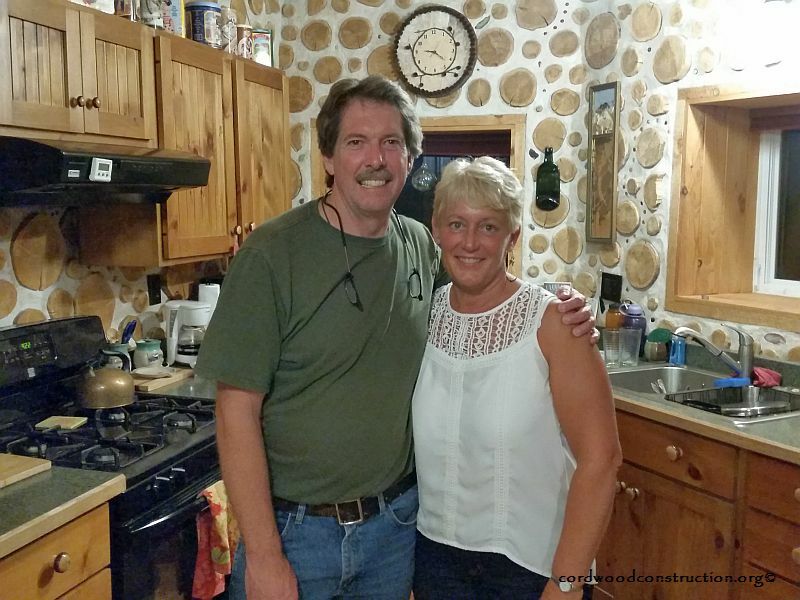 Bruce and Nancy in their kitchen. What delightful host/hostess they were. Bruce shows off his custom-made, counter-weighted, cordwood cut-off saw, while Tom Huber looks on in amazement. His saw cuts straight and true. 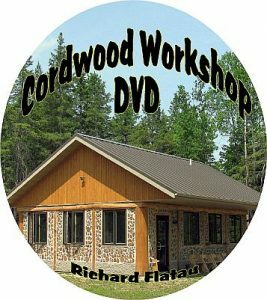 Should you wish to learn more about Cordwood Construction and all the different choices available, visit www.cordwoodconstruction.org or click on the book cover. PS There will be a Part 2 blog post in the future about the beautiful, hidden-post Guest House that Bruce and Nancy built first. Take a workshop at home! Click on the picture to learn more. 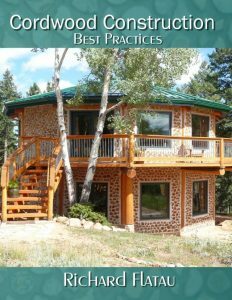 The latest information on how to build a BEST PRACTICES cordwood home. Click on the picture to learn more.